Kolejkowo, or the largest in Poland railway mockup, was opened on Dworzec Świebodzki, one of the oldest train stations in Wroclaw. 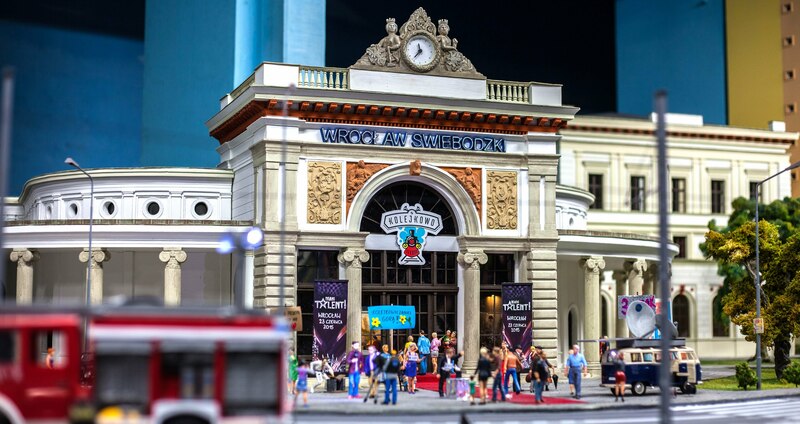 Almost 2,5 thousand of figures, 15 trains, 1 tram and 160 Wroclaw's buildings are there to be admired in their detailed miniature. And the most important: the plan is designed with attention to the smallest detail. It took two years to build the mock up, and the building of Dworzec Świebodzki itself took two months. The artists looked closely at the photographs and the documents and they were able to create an exact copy of this beautiful building in mini version. Kolejkowo shows us life in the tiny city and allows to think of our own stories about the people living there. They are waiting for the approaching tram, walking in the city centre or travelling by train. We get a chance to look at Wroclaw's tenement houses and learn about the villages of Lower Silesia. Apart from the miniature of the capital of Lower Silesia, Kolejkowo includes also Karpacz and Śnieżka mountain, together with the weather observatory. When those beautiful trains run along the rails, many adults remember how they dreamt about this type of toys when they were children. The youngest ones look at this miniature city with burning cheeks: moveable elements always make huge impression. Discover Wrocław – what is really worth visiting in your new city? Moving to Wroclaw is a great opportunity to get to know Lower Silesia. The capital of the region has a long history reflected in its architecture. Apart from visiting the historical centre of the city, it is a great idea to rest close to nature - Wroclaw’s parks are perfect for relax. Discover more about your new city. Here are the 5 places you have to see as soon as you arrive.